A futuristic vision of a rail tunnel under the Irish Sea, linking west Wales and Ireland, has been unveiled by a group of engineers. The Irish Academy of Engineers envisages a 50 mile link under the sea, with a journey time from Dublin to Pembrokeshire of one hour 10 minutes. A Vision of Transport in Ireland is looking forward to transport in 2050. High-speed trains travelling at up to 150mph are predicted by the Dublin-based academy. Academy president Liam Conellan said they hoped to "stimulate debate on a possible framework on travelling in Ireland." 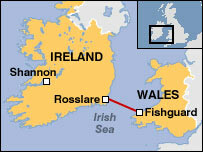 The vision proposed by the public body includes a tunnel link connecting Rosslare to Fishguard in Pembrokeshire across St George's Channel - the route of current ferry crossings. There would also be improvements linking Shannon on the west coast of Ireland. "If the vision went ahead it would it would increase mobility in Ireland immensely," said Mr Conellan. "At the moment there are 5.7 million people living in Ireland by 2050 we are expecting there to be 8 million. "By having a port in Shannon congestion at Rotterdam will be taken away. If Ireland is strongly linked to South Wales then financially it will be attractive. "By having closer contact both countries will see an increase in trade, passenger movement and tourism." Newport-based engineer Robert Dangerfield said: "Any links which will exist between Ireland and Wales can only be seen as positive. "It will enable Ireland to integrate themselves into the Uk and elsewhere. The biggest question has to be who will put up the money? "Culturally it will mean the levelling off of many cultures. But the biggest question has to be who will put up the money?" said Mr Dangerfield. "There has to be enough business both in Wales and Ireland in terms of passengers and trade for the link to be successful. "If the vision was to go ahead the answer for costing could come from grants which may or may not exist to integrate Ireland into Europe," He said. 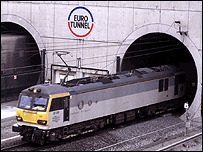 The Channel tunnel between England and France had a number of problems before it was finally operational. It was first dreamed of in the early 19th century, before plans in the early 1970s were abandoned. It finally got the go-ahead by the French and UK governments and took 10 years to construct and had cost almost £9 billion by the time it opened in 1994.